Floodplains play many important roles in a community, ranging from recreation areas to floodwater control. Below you’ll find some background on floodplains and other information on common terms connected with them. The history of floodplain mapping in Boulder County. How does Boulder County regulate development in the floodplain? Floodplains are a natural part of the environment. 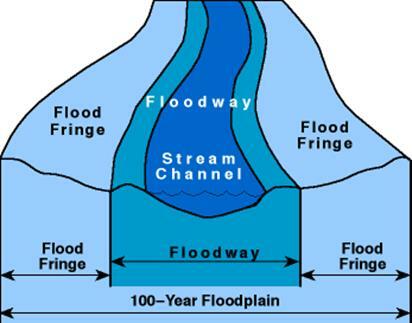 The floodplain is the area of land along a waterway (stream, creek, river, etc.) that is susceptible to inundation by floodwaters. The floodplain plays an important role in conveying flood waters and also has an ecological role such as improving water quality and recharging groundwater, providing aquatic species and wildlife habitat, creating recreational areas, and producing cultural value. The regulatory floodplain delineates the predicted flood height and inundation boundaries of a flood that has a 1% chance of occurring in any given year. This is also known as the “100-year flood”. The predicted water level during the 1% annual chance event is called the base flood elevation. The regulatory floodplain is what the Federal Emergency Management Agency (FEMA) and local authorities use to regulate public and private development and calculate flood insurance. In Boulder County, the regulatory floodplain consists of regulatory FEMA Floodplain zones together with regulatory Boulder County Floodplain zones, and is referred to as the “Floodplain Overlay Zoning District”. Historical records confirm the destructive force of floodwaters throughout Boulder County. In addition to the 2013 flood, large, damaging flood events occurred in 1894 and 1969. Regular, smaller flood events have periodically affected county watersheds throughout time. Most of the county’s current FEMA floodplain maps are based on studies from the early 1980s. What changes the physical floodplain? Land use changes such as new buildings, grading, and roads, culverts and bridges will change the flow of floodwaters and, therefore, the physical floodplain. In addition, significant flood events can change the course of rivers by depositing or removing river gravels and sediment, also changing extents and characteristics of the physical floodplain. What changes the regulatory floodplain? It is important to periodically update regulatory floodplain maps to reflect physical changes that have occurred to waterways from development and natural causes. In addition, as technology advances, hydraulic engineers can incorporate both more accurate topographical information and more refined discharge calculations for the 100-year flood resulting in more precise prediction of flow paths and flood elevations and changes in the regulatory floodplain. How does Boulder County regulate development in a floodplain? Boulder County’s Land Use Code outlines regulations specific to the regulatory floodplain in Article 4-400. Development within the floodplain requires a Floodplain Development Permit. Floodplain development is defined as any public or private construction or activity that changes the basic character or the topography of the land on which the construction or activity occurs, including but not limited to any man-made changes to improved or unimproved real estate, construction or substantial improvement of buildings or other structures. Limitations on which activities are permitted in various floodplain zones and requirements are detailed in Article 4-400.